As a rule, the assets needed to finance pensions are collected with the pension contributions paid each year. Employer, employees and the self-employed pay pension contributions. This way, the working-age generation contributes to the pensions of those who have retired. Part of the pension contributions collected each year are funded. They are set aside to make sure that there is enough money to pay pensions also in the future. The pension providers manage the pension funds. 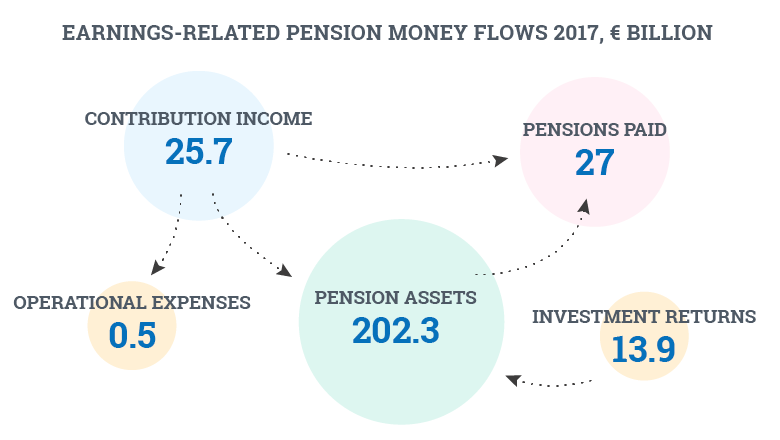 In 2017, a total of 27 billion euros were paid in pensions. A total of 25.7 billion euros were collected as pension contributions. The pension providers invest the funded components of the pension contributions that they collect as protectively and efficiently as possible. It is not enough to maintain the value of the investments. Instead, the pension providers strive for as high an investment return as possible. Each year, part of the pensions that are paid out are financed with the investment return of the pension funds. As people in Finland live longer, the number of retirees compared to the number of working-age people keeps growing. The higher the investment returns are, the lower is the pressure to raise the pension contribution rate. The assets in the pension funds cannot be used to pay for anything else than pensions.